On Veterans Day we remember those American veterans who have served our great country. Veterans Day originated in 1919 as “Armistice Day”. The first anniversary of the end of World War 1. It became a national holiday in 1938. The name was later changed by President Dwight Eisenhower in 1954 to Veterans Day. Year round, Best Corporate Events offers a unique give-back team building program that supports the brave men and women proudly serving our country and the Veterans. 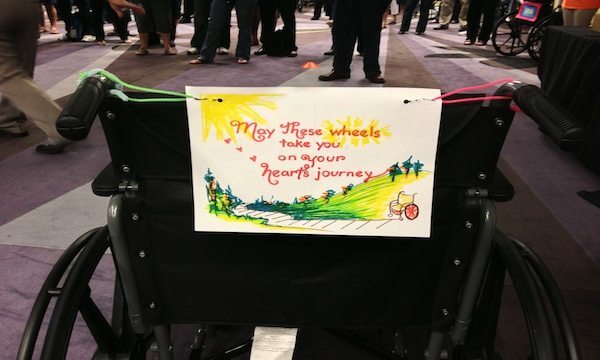 Build-a-Wheelchair® is a corporate social responsibility program. It was born out of a desire to help American veterans and others with various mobility challenges. In this fun and worthwhile program, groups use teamwork skills and iPads® activities to earn the materials necessary. Teams assemble, test and decorate these new wheelchairs for donation. Once completed, artistic notes of encouragement are designed and attached. During Operation Military Care, teams work through a series of engaging teamwork exercises, iPad® challenges, and photo & video activities to earn the points needed to acquire care package contents. Teams also earn points by demonstrating high-performing team attributes such as clear communication, leadership, innovation and team spirit. After all the items are acquired, teams assemble the military care packages and add personal touches in the form of letters written to the recipients that receive the boxes. When possible, a representative from a Military Charity will be on hand to accept the generous donation on behalf of these deserving heroes. Your team will leave the event with a deep sense of patriotic accomplishment.